The occurrence of intestinal metaplasia, for which a relationship with gastric cancer is strongly suggested, has been demonstrated in approximately 60% of patients with H. pylori infection.1 The metaplasia may then progress to gastric cancer, especially to tumours of the intestinal type.1 Findings by Uemura et al. support the importance of these histological findings as a precancerous condition in H. pyloriassociated gastritis.3 However, only a minority of H. pylori-infected patients develop gastric cancer, which underscores the notion that the host genetic background could be of critical importance. The study used 41 archival paraffin-embedded gastric cancer tissue blocks obtained in 2007 from endoscopic biopsies and gastrectomies. Haematoxylin and eosin-stained slides were reviewed and the tumours classified according to the WHO Center for the International Histological Classification of Tumors. DNA was extracted using the QIAamp DNA kit. The study was approved by the Aga Khan University (East Africa) Research and Ethics Committee. The H. pylori status was determined by polymerase chain reaction (PCR) using the ureA gene according to the method of Miyabayashi et al.5 The ureA region was amplified using the following primers: 5'-AAGCTTTTAGGGGTGTTAGGGGTTT-3'. The IL-1B fragment was amplified using the following primers: 5'- TGGCATTGATCTGGTTCATC-3' and 5'- GTTTAGGAATCTTCCCACTT-3', while the IL-1RN intron 2 containing a penta-allelic 86-bp tandem repeats (VNTR) DNA oligonucleotides 5'-CTCAGCAACACTCCTAT-3' and 5'-TCCTGGTCTGCAGGTAA-3' flanking this region were used as primers. Statistical analysis to determine the relationship between variables was performed using the chi-square test with p-values less than 0.005 considered as significant. Linear regression determined how independent factors predicted the outcome of dependent factors. 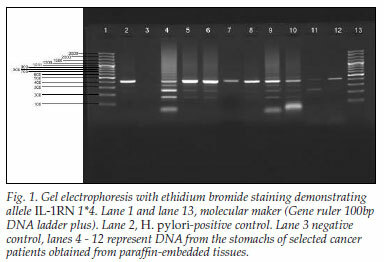 We analysed 41 gastric biopsy samples that were preserved in formalin and embedded in paraffin wax, obtained over a year. All the biopsies were of adult Kenyan patients with advanced gastric cancer; 31 (76%) were of the intestinal type and 24% were of the diffuse 'signet ring' type; 26 (63%) were from male and 15 (37%) from female patients; their ages ranged from 36 years to 76 years, with 56% <50 years of age. We screened for the frequencies of genotypes and alleles of IL-1B and IL-1RN in these cancer tissues. Overall, 19 (46%) patients had IL-1RN while 18 (43%) had IL-1B. When analysed, the IL-1RN found in the Kenyan gastric cancer population only showed allele IL 1RN 1*4 (Fig. 1). In contrast, when IL-1B was analysed by PCR-RFLP (restriction fragment length polymorphism) method, it gave products that either remained intact (allele 2; IL-1B-511*2) or were cut into two fragments of 190 and 114 bp (allele 1; IL-1B511*1) (Fig. 2). The H. pylori gene was present in only 6 of the 41 samples. This was expected because, when H. pylori has been present for many years and the stomach becomes atrophic and hypochlorhydric, the intragastric environment is no longer optimal for H. pylori. Competing faecal-type organisms are then able to colonise the stomach. Furthermore, H. pylori is able to colonise only normal gastric cells, and not those that have differentiated into intestinal metaplasia. Therefore, H. pylori disappears from the stomach when atrophy and intestinal metaplasia supervene. In patients who are most likely to develop gastric cancer (those with extensive intestinal metaplasia and atrophy) and those already with advanced cancer, as in our cases, the serology is often negative and the genes will almost always not be detectable by PCR. No significant relationship was found between age and either IL-1RN or IL-1B in gastric carcinoma from Kenyan patients; the chi-square test for both was not significant: p=0.9 for IL-1RN and p=1.0 for IL-1B, against a significance level of 0.3 and 0.2 respectively. This indicates that these variables are probably independent of each other. Similarly, there was no relationship between gender and the occurrence of either IL 1RN or IL-1B. Linear regression also showed that neither age nor gender influenced the expression of IL-1RN or IL-1B. The situation differs, however, concerning the relationship between IL-1RN and IL-1B. The large chi-square statistic (8.021) and a small significance level (0.005) indicate that it is unlikely that these variables are independent of each other. Therefore, we concluded that there is a relationship between the occurrence of IL-1RN and IL-1B. Linear regression showed an R-value of 0.45, which indicates that a great deal of variance is shared by IL-1RN and IL-1B. Analysis of variance (ANOVA) obtained from the regression F=9.5 appears to indicate that the predictor variable IL-1RN is not equal to the dependent factor IL-1B, and that the presence of IL-IRN could be used to predict the presence of IL-1B. Il-Ran Hwang et al. found that carriers of IL-1B-511 T/T genotypes, denoting a single band of 155 bp or IL-1RN*2, had higher mucosal IL-1β cytokine levels compared with non-carriers.6 They also observed that carriers of IL-1RN 1/*2 had higher mucosal IL-1β levels than those of IL-1RN 1/*1 consistent with an effect of this polymorphism on mucosal IL-1β. Also, IL-1RN 1/*2 carriers have atrophy scores approximately 1 point higher than IL-1RN 1/*1 carriers, which implies that in IL-1RN 1/*2 carriers atrophy is accelerated such that the mucosa are functionally 20 years older than the gastric mucosa of IL-1RN 1/*1 carriers. IL-1RN*2 allele occurs in the Kenyan population at a much higher frequency (46.3%), in contrast with reports on Western and Asian populations.7 For example, the frequency of the IL-1RN*2 allele in East Asian countries was lowest (3 - 6%), while that of the Thai population was 12%. The frequency in Western populations was reported as 22 - 24%. 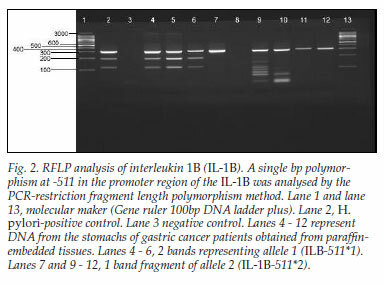 In conclusion, this pioneer study of genotype polymorphisms for interleukin 1 in the Kenyan population provides evidence that individuals with IL-1B and IL-1RN polymorphisms associated with H. pylori infection have an elevated risk of developing gastric cancer. Since it was a pilot study, the observed significant association could be a chance observation because of lack of complete clinical information on the patients whose tissues were used. Our findings require confirmation by prospective analysis of a larger sample, looking at other related co-factors. This study was supported by Dr Varocha Mahachai and Dr Somying Tumwasorn of the Department of Medicine and Microbiology, Chulalongkorn University Hospital, Bangkok, Thailand; and Dr Ratha-Korn of the Gastroenterology Unit, Department of Medicine, Thammasat University Hospital, Pathumthani, Thailand; and it was authorised by the Aga Khan University Hospital, Nairobi, Kenya and the Jomo Kenyatta University of Science and Technology, Nairobi, Kenya.